I don't know if it's their cozy fall-like vibe or their super chic patterns, but I just can't get enough of kilim throw pillows these days. They are super cool and add the perfect dose of texture to any space. I've been a little hesitant to pull the trigger on a kilim pillow for our home because they're a little pricey and, well, let's be honest, everything in my house right now is covered with a nice layer of soy milk and spit up. Sooooo. Do you think vintage kilim fabrics are machine washable? Mhm. Needless to say, I'm loving me some kilim pillows lately. What are your favorite kilim sources? 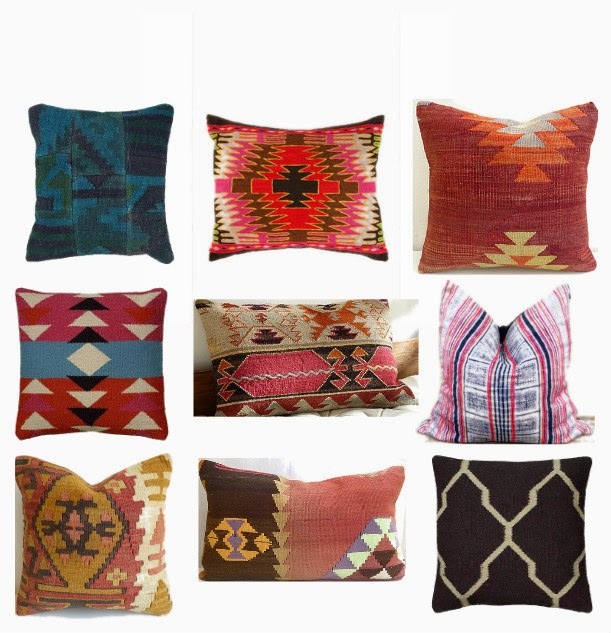 I love Kilim pillows as well! LOVE kilim pillows. I've had my eye on that PB in the middle for awhile now. Must pull the trigger soon! Pillows are my achilles heel - we own way too many of them bc that's the only way I know how to redecorate!! These are super cute ones!! I know this web site presents quality based content and other data, is there any other site which presents these information in quality?